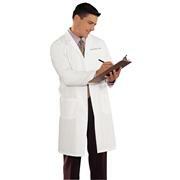 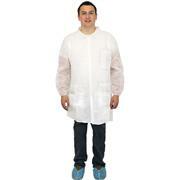 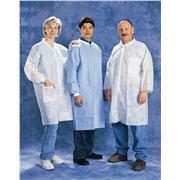 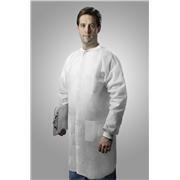 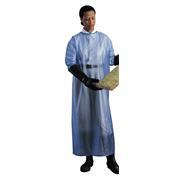 These 3-layer polypropylene lab coats feature knitted cuffs and collars for added comfort. 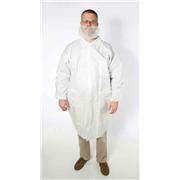 Ideal for non-hazardous particulate and light spray exposures. 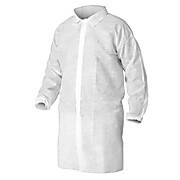 Includes 3 pockets. 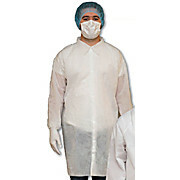 Available in white or blue, in sizes MD - 3XL, Packed: 30/CS. 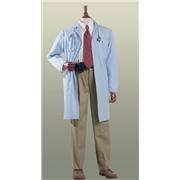 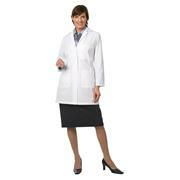 Lab Coats have a button front, left front pocket and two lower outside pockets with side slits for access. 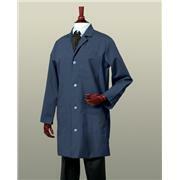 These Navy blue coats are 41 in. 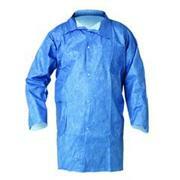 in length (based on size Medium) and are 65% polyester and 35% combed cotton poplin. 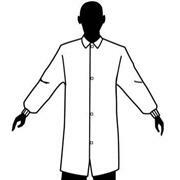 Coats are for use by men or women. 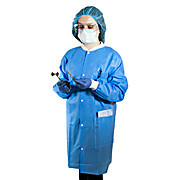 Economical Apparel is made of an anti-static treated, lightweight and durable polypropylene fabric, which is cloth-like and has exceptional breathability. 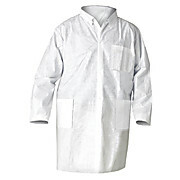 Ideal for non-hazardous personal and product protection, while providing cool comfort all day. 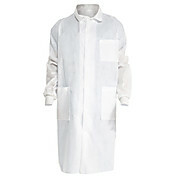 White lab coats feature five snaps and elastic cuffs. 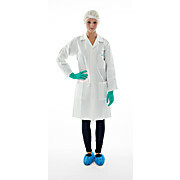 The BioClean-D™ single use Lab Coat is manufactured from antistatic lightweight low-linting CleanTough™ material and features press stud fastenings, open cuffs, three pockets and a rear vent. 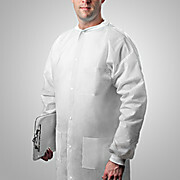 Lab coats are 41 in. 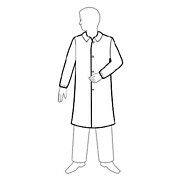 long (based on size Medium). 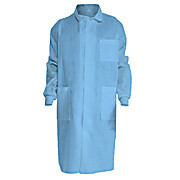 Coats are 80% polyester/20% combed cotton poplin. 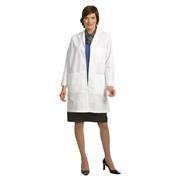 Coats feature a left front breast pocket and two lower oversized outside pockets with side slits for pocket access. 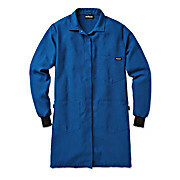 Designed for wear by men and women. 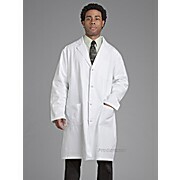 Staff length coats are 41” in length based on size 40 Coats feature a button front, left breast pocket and two lower outside pockets with side slits for access. 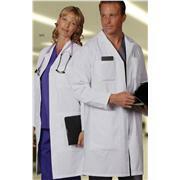 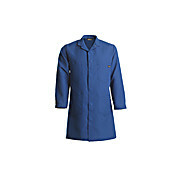 Coats are 65% polyester and 35% combed cotton fine line twill. Lab Coats have a button front, left front pocket and two lower outside pockets with side slits for access. 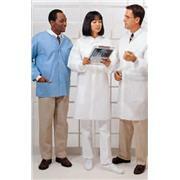 These Azure blue coats are 41 in. 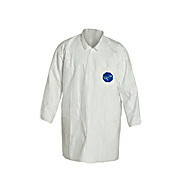 in length (based on size Medium) and are 65% polyester and 35% combed cotton poplin. 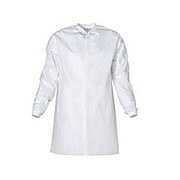 Designed for wear by men or women.